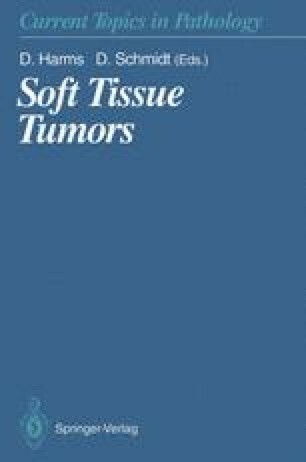 Synchronously with the acceptance of fibrohistiocytic tumors, especially of malignant fibrous histiocytoma (MFH) as a tumor type in the second edition of the WHO classification of soft tissue tumors (Weiss 1993), there is increasing criticism of MFH as an entity (Donhuijsen et al. 1987; Dehner 1988; Fletcher 1992). MFH of the bone was questioned as an entity already years ago (Dahlin et al. 1977). MFH as a sarcoma type became popular during 1960s among Stout and his co-workers (Ozello et al. 1963; O’Brien and Stout 1964; Stout and Lattes 1967). MFH was described as being characteristically composed of two cell types: (a) roundish or polygonal — histiocyte-like; and (b) spindly — fibroblast-like. Varying number of multinu-cleated giant cells, with or without atypia, may be admixed. Collagenous or mucoid intercellular substances vary intralesionally and interlesionally. A whorly cellular arrangement, called “storiform pattern,” was thought to be an important differential diagnostic criterion for MFH — even if not ubiquitous (Meister et al. 179; Enzinger 1986).